We have an aim in our organisation to make care better for everyone in Scotland. And we often describe ourselves as having ‘many parts, one purpose’. It is very fitting description when you take a look at the broad range of activities we get involved in. However it also feels right! The landscape of health and social care is so diverse that it is no surprise that the national improvement organisation mirrors that diversity. There is a great diagram in our new strategy ‘Making Care Better’ which illustrates the point (see below). Much of our work can be described under the umbrella term of ‘providing evidence’ for improving care. In our organisation this includes providing independent research, evaluation, advice on technologies, medicines, psychological interventions and models of care and developing clinical guidelines and standards based on the best evidence available. 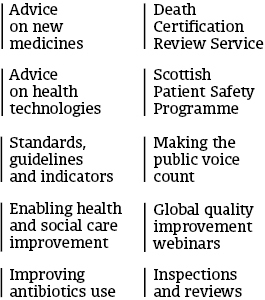 We have teams which do this including SIGN guidelines team, the Scottish Medicines Consortium (SMC) and the Scottish Health Technologies Group. But how does providing evidence improve the quality of care? The answer for me is that given the multitude of tests, medicines and treatments now available to modern medicine is isn’t always clear what would benefit patients most. But going to the evidence base can, at times, be a slow process. In a world where people, in general, look for quick answers and immediate benefits in all facets of life, this can be a concept that can be challenging. So we are responding. Those working in research and evidence development can often be perceived as being too slow to produce the evidence that practitioners and policy makers need to make decisions. This is not without basis; the statistic regarding the (inordinate) time it takes to get evidence into practice is well known. Another criticism is that evidence-based advice is often littered with caveats, given that for many interventions research evidence is scant or of poor quality. It would appear to me that these are fair points to raise. So our underpinning philosophy is that we need to ensure that decisions are evidence informed, rather than evidence based. This means that we gather and present in as systematic a way as possible as much evidence, from research and other sources, as we can in the time available prior to the decision point, rather than seeking perfection. This principle is working this way through many of our organisations ‘evidence’ functions. SMC use a rapid method to assess the cost-effectiveness of medicines and the Scottish Health Technologies Group is also using rapid review approaches. Our SIGN guideline team (producing guidelines for clinicians and patients on the most appropriate treatments) are small, highly skilled, flexible and responsive to the evidence required by patients, families and carers. We recognise that we have a responsibility to not only identify, synthesise and present existing evidence in a way that can be used to make decisions and develop approaches to improvement, but we must also support the need to generate evidence. Our research and information teams have been instrumental in initiating and evaluating the impact our work has on people in an ‘evidence informed’ manner. This approach also has a benefit when it comes to sharing knowledge and evidence – so that good ideas can be more quickly spread to others, and ideas that have not had the desired impact are not replicated. All of this is challenging work, but we like a challenge and are confident that our energy, knowledge and skills mean we are up for the job! What a carefully considered and thoughtful blog. Thank you for sharing. I do so agree with this approach: “our underpinning philosophy is that we need to ensure that decisions are evidence informed, rather than evidence based”. You ask in your blog “Do we need perfect evidence when making decisions?”. I am of the view that there is no such a thing as perfect evidence, however I do think that science requires philosophy and ethics. That is why I welcome your inclusion of philosophy in the above organisational approach to evidence. However I am concerned, as I have explained to Dame Coia, Robbie Pearson and Dr Brian Robson, that there is no consideration – or even mention of – ethics as necessary for science by Healthcare Improvement Scotland. Ethics do not appear in the matrix/diagram above. Some QI proponents have suggested that to address the “perceived slowness” of science – and to “improve” science – we take shortcuts with ethics. I am afraid I could not disagree more. Especially when “pilots” are being scaled-up nationally as part of “good practice”. I submitted this rapid response on ethics and improvement science (QI) to the BMJ a few months ago. If you have any thoughts on this subject it would be great if you could post them here.